Data Doctor Live Chat allows your web site visitors to chat with your company representative and have their questions answered instantly by clicking on a live chat button embedded on your web site. 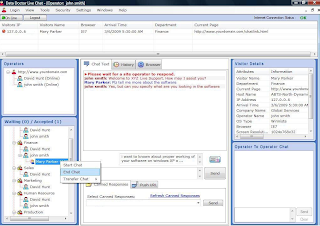 Live chat utility provides online chat support for one or multiple customers and visitors simultaneously in real time. It also provides option to send offline messages when the web operator is not online or is unavailable on chat window. * Provide live help support and proactive sales for your website visitors in real time. * Live chat software easily integrates with your existing website. * Help increasing customer satisfaction by answering their queries in real time. * Cost effective utility saves user time and money to interact with customers. * Simple and easy to configure at machine.